Rose petals have been used for some time in infusions and preserves. Now, they are choice ingredients for desserts, conferring a light and very pleasant taste to fried dishes, like rose petal tempura, a delicious entree that is rich in vitamins. The watercress, or flower of the Nasturtium, is very decorative, has a slightly hot flavor and is rich in vitamin C. It is perfect for salads. Native of Peru, it was introduced in Europe in the end of the 16th century and today is planted worldwide. The marigold (Calendula), originally from the center and south of Europe and Asia, was already cultivated in gardens in the Middle Ages. It was dehydrated and used as food coloring in broths, yellow cheeses, butter and cakes. Its fresh petals are used in salads, crepes or rice, where they can replace saffron. Native of Europe and Eastern Asia, the viola (or pansy) has spread throughout the world. Beside its diuretic properties, it is often used in salads and desserts. The flower of the Borago, native of north Africa, has been known for centuries for its beneficial effects over body and mind. It should always be used fresh as it loses its properties once dried. It is a frequent presence in salads or cakes and desserts. The begonia, tulip, lavender, and geranium are also included in this selection. Their use varies according to the imagination and experience of the cook, always considering their characteristics – in essence, as with any other culinary ingredient. Vinegars and oils can be aromatized with flowers. 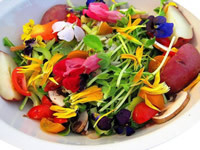 Sprinkle flowers onto your salads to make them more colorful and tasty. Place a flower upon the ice-making utensil and cover it with water. Then place it in the freezer and remove it when its time to serve. Allium schoenoprasum (chives) - The popular chives, used in salads. Aloysia citriodora (lemmon verbena) - Flowers are used to give aroma to wine, stuffing, poultry, preserves and deserts, as well as French liqueurs. Originally from Chile and Argentina. Althaea rósea (hollyhock) - Of Chinese origin, its flowers are large, and can be white, yellow, red or wine-color. Used in salads and to darken wine. American Agave - From Central and South America. Its inflorescence lasts between 10 and 20 years. Cultivated in Mexico since 1561, its flowers are eaten in tortillas. Its sap is fermented to obtain pulque, a drink that when distilled originates tequila or mescal. Anethum graveolens (Dill) - Flowers are used in cucumber or cauliflower pickles. Anthemis tinctoria (yellow chamomile) - From the south and center of Europe, it flowers between July and October in Europe. Used to make teas and jellies. Averrhoa carambola (carambola or starfruit) - Its flowers are used in salads. Its fruit is known as starfruit because when sliced transversally it is star-shaped. Can be consumed raw or pickled (immature fruit), jelly, broth, juice or preserve. The starfuit juice is also good to remove stains from hands and clothing. In Brazil it was introduced in the state of Pernambuco in 1817, by the Portuguese, who brought it from India. Its origin is most likely African. Bauhinia purpurea - Its flowers are large and red or rose. Used in salads, specially fish salads, like tuna. Borago officinalis (Borage or starflower) - The flowers, when young, have a blue tone and, when older, become rose. Its petals form a five-point star and originate from Asia or the Mediterranean. Used in salads, make for a multi-colored plate and, they say, tastes like cucumber. Also used to give aroma to vinegars. In antiquity believed to have a magic effect on the body and mind, making man joyful and happy. Calendula officinalis - The popular marigold. Its petals can be mixed with rice, fish, soup, cheeses, yogurts and omelets, giving a saffron color. Also used to color butters and cheeses. Crocus sativus (saffron) - True saffron. A very expensive plant because to obtain one kilo of saffron one would need 100 thousand flowers. Used for centuries in sauces and to season rice and poultry. Cucurbita pepo (pumpkin) - Its flowers can be eaten fried, breaded with egg and flour, in a soup or stuffed with a strong cheese. Dianthus caryophyllus (carnation) - Its flowers can be used in salads, fruit tarts, sandwiches, or to give flavor to vinegars, jellies, sugar and wine. When sugared, can be used to decorate cakes. Its dye is widely used in confectioning. Helianthus annuus (sunflower) - Its floral buttons are boiled and served like asparagus. Its flowers are used in salads. Cultivated by the indigenous peoples of northern Mexico, more than 3,000 years ago. Myrtus communis (myrtle) - Its petals can be used in fruit salads. Nasturtium - Often used in salads. From Peru, taken to Spain in the XVIth century. Its colors range from yellow to red, and its flavor recalls water-cress. Pansy - Velvet structure and refreshing flavor. Good for salads and adding aroma to vinegar. Pelargonium capitatum (coastal geranium) - Often used in salads. Primula - Its colored petals have a light and sweet flavor. Rose - Very traditional in Arab cooking. Used in creams and mousses or mixed with fruit juice. Normally an infusion is made first, to concentrate the flavor. Also used in lemonade and orange juice, for an exotic twist. Squash - The most well known edible flowers. Can be stuffed, eaten with salty dishes and used in risottos and salads. Tabebuia heptaphyla - Its rose colored flower is edible. Also used to make tea. Characteristic of the Atlantic Forest in South America, flowers from June to September. Tabebuia impetiginosa - Like its rose counterpart, its flowers are also edible. Flowers from May to September and originates from the Atlantic Forest in South America. Tropaealum majus (nasturtium) - Showy flowers, yellow or red. First used in the Orient. The flowers, leaves and seeds have a peppery taste. Viola odorata - The true violet (not the African violet, found in floriculture) When young, used in salads. When crystallized is used in cake decorations, puddings and ice-creams. Base: Basal part of a plant, where the main stem connects to roots.